As the year winds down, I took a look back to see which aspects of the Internet of Things interested you most during the year. Based on readership of the daily Connected Thinking here, the top items ranged from robotics to luggage that can be tracked anywhere in the world, and lots in between. 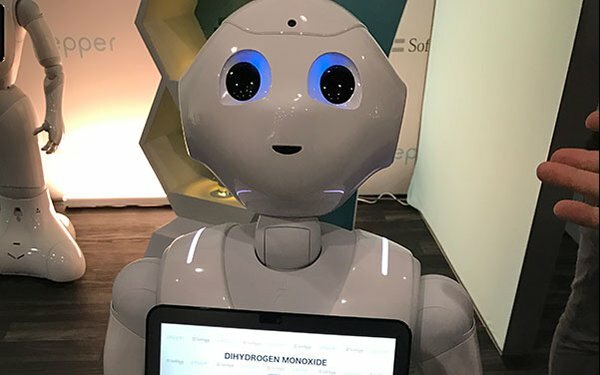 Pepper The Robot Looks To Engage Customers. One of my personal favorite robots, Pepper from Softbank will be featured in private showings again at CES, along with expected new features. Wisconsin Company Employees To Get Microchips Implanted The idea of chips being put into humans creeps some people out and at least one state moved to outlaw the practice. Internet-Connected TV Penetration Reaches 74%. Pretty much any TV sold these days is a smart TV. The question still remains of how much of the actual capabilities that come with the sets will be used. Next In Connected Cars: License Plate Advertising. With a move to connect anything that moves, one company created an approach to send ads to license plates, such as when on cars parked at a shopping center parking lot. CES 2017: Smart Home Gadgetry Galore. This one is even more relevant now, since I’ll be heading to the annual CES in Las Vegas in about a week. I’m expecting this headline will stand for the coming January as well. Red Bull, AT&T Connecting 1 Million Beverage Coolers. Following Budweiser Red Bull launched connected coolers powered by AT&T. Cruise Ships Get Wired For Connected Customer Experiences. The major cruise ship companies go the IoT bug and started rewiring their ships for connected sensors throughout. Most Consumers Still Not Familiar With Most Smart Devices. Plenty of Internet-connected devices entered into the market during the last year but that doesn’t mean everyone knows what they are or how to use them. Hershey's Taps VR To Test In-Store Marketing. In one of the most innovative and practical uses of virtual reality, System1 Research created a virtual store to test various displays of Hershey products. Tumi, AT&T Team To Track Luggage Anywhere In The World. I tried one of these little gadgets in a trip to Prague, and it tracked my luggage every step of the way. The Delta app let me know the luggage was scanned, but the Tumi app let me know it was actually on the plane. Hope this recap is helpful as at least one indicator of some of the trends in the world of AI and the Internet of Things. What would you expect to be the major AI or IoT developments in the year ahead?